Last week, commons advocates the P2P Foundation, Guerilla Translation, and their partners launched Commons Transition, a public forum to further commons-oriented policy-making. Commons Transition is based on the groundbreaking work of the Free/Libre Open Knowledge (FLOK) Society in Ecuador. Read the full article here. Participants: 28 young people (18 – 30 Years) – 1 from each EU country and 8 from other continents as guests Date: 26th April to 3rd May 2015 Place: Schloss Tempelhof – Germany Final Application Day: 15th February 2015 More details about the event here. Comfrey is a fairly humble looking plant. It has large hairy green leaves and small bell-shaped flowers, typically colored either purple or white. However, what it may lack in striking appearances, it certainly makes up for in the myriad benefits it can give to a permaculture plot. Read the full article here. 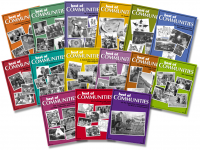 Best of Communities Collections – New [Downloadable] Products!